The UK elections watchdog has suspended its probe into loans to political parties pending the outcome of the Metropolitan Police investigation. The Electoral Commission said the decision followed talks with police. Scotland Yard said there were overlaps between its probe into "cash for peerages" claims and the commission's inquiry into millions in secret loans. The commission wants party treasurers to confirm the loans they had received were agreed on commercial terms. A commission spokeswoman said: "There's potential for the police investigation to overlap with areas we are looking at so it's better for the police to deal with it." The suspension would last only until the police had completed their inquiries because the Electoral Commission was not yet satisfied that election funding laws had not been breached. A Met Police statement said: "The investigation continues into allegations of awarding of honours in contravention of the Honours (Prevention of Abuses) Act 1925. "As the investigation has progressed it has become clear there are inevitable overlaps between the 1925 Act and the Political Parties, Elections and Referendums Act 2000. "As a result we are working closely with the Electoral Commission." On Tuesday Tony Blair and Tory leader David Cameron met for talks - afterwards they said they had agreed the need to change party funding rules before the next election. Mr Blair, Mr Cameron and the Lib Dems all say they will declare future loans. Former Whitehall chief Sir Hayden Phillips has been appointed to liaise between parties with ideas for reform - which include possible state funding for political parties. Before their meeting, Mr Cameron said he would be outlining his plans to the prime minister for a cap on donations, tax relief for small donations to encourage new membership and "modest" state funding. At present anyone donating more than £5,000 has to be named - but people lending money on commercial terms do not have to be. 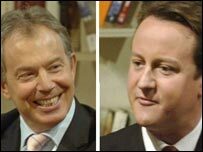 Liberal Democrat leader Sir Menzies Campbell pressed Mr Blair and Mr Cameron to say why they funded their election campaigns with "large scale concealed loans" and at what benefit to the lenders. The UK Independence Party (UKIP) said it feared a "stitch-up" of smaller parties, particularly if Mr Blair and Mr Cameron extend the existing formula, which restricts state funding to parties with two or more MPs.